As was written, an isotope that is long-lived or even stable is known as reactor slag. The accumulation of these parasitic absorbers is known as reactor slagging and determines the lifetime of nuclear fuel in a reactor, since their buildup causes (together with a decrease in fissile material) continuous decrease in core reactivity. Samarium 149 belongs to this group of isotopes, but its importance is so high, that it is usually discussed separately. As can be seen from the table, there are numerous other fission products that, as a result of their concentration and thermal neutron absorption cross section, have a poisoning effect on reactor operation. Other fission products with relatively high absorption cross sections include 83Kr, 95Mo, 143Nd, 147Pm. Individually, they are of little consequence, but taken together they have a significant effect. These are often characterized as lumped fission product poisons. 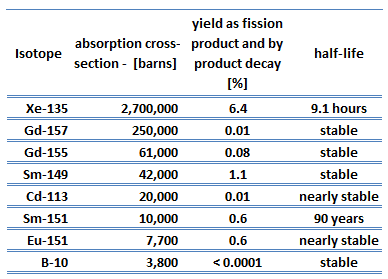 accumulation of fission products with significant absorption cross-section. This is the reason, why some nuclear power plant operators use reprocessed fuel to partially replace fresh uranium fuel. Nuclear reprocessing is technology that was developed to chemically separate and recover fissionable material from spent nuclear fuel as well as to remove these isotopes with significant absorption cross-section.